Although you have a childlike spirit, let’s be honest – you’re just not as young as you used to be. But, just like when you were a kid, your smile still bothers you. You have a small gap, some crowding on top and a couple of rotated teeth on the bottom. Since you’re a busy adult now, you want straight teeth, but don’t want to deal with a mouthful of metal…and you definitely don’t have time to see the dentist every two weeks to have adjustments made. What treatment would save you time and keep your smile makeover not so obvious? With Dental Expressions, you can improve your teeth and look good at the same time with Invisalign near Kaukauna, WI. Invisalign is the premier name for invisible braces. You’ll work with Dr. Robert Heil and Dr. Heather Heil to discuss the final result you’d like to achieve. After your personalized treatment plan is determined, your dentist near Kaukauna, WI will take X-rays, pictures, and impressions of your teeth to create a 3D image of your smile. This virtual model will allow you to see exactly how your teeth will progress to become perfect. We’ll send your impressions and information to the lab so they can custom create the clear aligners that will straighten your teeth. You’ll receive all the aligners at once, and they’ll be numbered for you, so you’ll know what pair to wear and when. About every two weeks, you’ll simply switch to a new pair of invisible aligners and you’ll watch your smile transform right before your eyes. That’s it – just wear Insvisalign and get the results you want. Well-Balanced Diet – While undergoing treatment with Invisalign, you can still eat all of your favorite foods – including popcorn, carrots, apples, corn on the cob, and even caramels. You won’t have to choose between the treats you love and the smile you deserve. Time Saving – Although you’ll have a few checkup appointments during the course of your Invisalign journey, biweekly adjustments to braces are something you’ll never need to worry about. You’ll save time and money with fewer necessary dental visits. Improved Self-Confidence – People today understand how much self-concept matters when it comes to mental health as well as achieving the success you’ve dreamed of. In fact, 45% of study participants thought that individuals with straight teeth were more likely to land jobs than people who were just as qualified, but didn’t have a stellar smile. Both during and after Invisalign, you can hold your head up high. Increased Oral Health – Although your smile will be beautiful, straight teeth aren’t just about good looks. Having properly aligned dentition makes brushing and flossing properly easy (reducing tooth decay and gum disease), can lessen headaches caused by crooked positioning, and can eliminate chips and breaks from improper biting. And, with Invisalign, you won’t have wear and tear to your gums and mouth – you can say goodbye to dental wax. 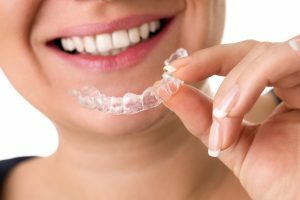 Since Invisalign can improve the quality of life for our patients, and keep them looking great in the process, schedule your appointment today to get the winning smile that’s worthy of you!